The red spots on this person's back appear where blisters (bullae) caused by Erythema multiforme have ruptured and the overlying skin removed (denuded). The resulting lesions are yellow-crusted ulcers (erosions). 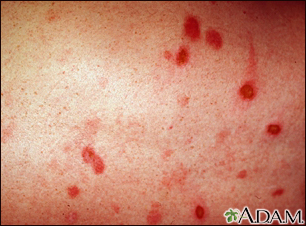 Erythema multiforme may be associated with herpes simplex infection, mycoplasma pneumonia, or other medical conditions such as streptococcal infection, tuberculosis (TB), or may result from exposure to chemicals or medications.